The breathtaking Geist Reservoir Home was recognized as the “Integrated Home of the Year 2018” by Custom Electronics Design and Installation Association (CEDIA). Gary Nance, a top architectural designer in Indianapolis, partnered with technology experts at The Premier Group to bring his clients’ vision for this smart and sophisticated lakeshore home to life. 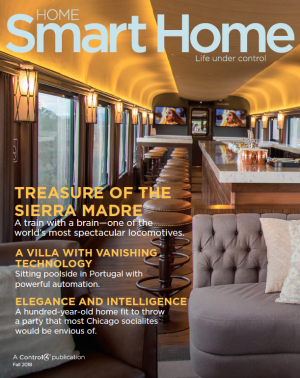 The award-winning smart home was a residential new construction project located in Indianapolis, Indiana. It is carved into a lakeside parcel of land and filled with custom finishes and one-of-a-kind finds. It is also completely automated with a comprehensive Control4 technology package. We asked Gary to tell us about how he approached the design, which aspects he’s most proud of in the award-winning home, and what he’s learned when it comes to incorporating smart home technology into his projects. What were your first thoughts about the Geist Reservoir Home project? My first thought was that I’ve been in the business too long if I’m tearing down my own designs! Yes, the home that they were tearing down to build the Geist Reservoir Home was one I had designed over 30 years ago! After that initial thought, I realized that, while that first home was a neat house at the time, you can do so much more with a house these days—and that’s when I started to get excited. I’m always looking ahead, and that’s exactly how I approached this project and set out to make something really special. It was a beautiful lakeside lot and, while not as big as some of the other lots around, I knew I could make the home flow in a way that would bring it to life. And I feel like the CEDIA award proves that the team was successful in doing just that. What design aspects are you are most proud of in the home? I wanted to create a flow within the house that brought in the natural environment that surrounds the home. It was important to me, and I am happy to say I believe we achieved that. I think the front entry and the stairwell opens up the space from front to back to really bring in the natural beauty around the home. The bathroom is another example of how we tied the outdoor beauty into the home. We put in a freestanding tub with a vanity near a floor-length window, and, to get the makeup area to fit seamlessly in the space, we put in a floating mirror so there is no wall to interrupt the flow of the space and view of the lake. A fun bonus is that the mirror is also a TV. How did smart home technology bring your design to life? When you are in the home, the placement of the lighting, the type of lighting, and the illumination level is perfectly designed for each space. There is no way a normal electrician could have created what The Premier Group achieved. They took my design and really brought it life. They even made the lighting design very easy to control as a homeowner. The lighting showcased certain things in the home and highlighted rooms in just the right ways to make the spaces feel like art. For example, there was an imported petrified sink that the team lighted in such a way that really made it feel like a museum piece. And, when walking down the entry stairs, there are square museum-quality lights from Lucifer Lighting perfectly placed that just showcases the space perfectly. What was the working relationship like with The Premier Group? It was great because we could work together—we were all chefs in the kitchen, so to speak, and were able to add just the right ingredients to make something the homeowners love. Ken from The Premier Group was there on site when we met with the client who sometimes asked for some pretty elaborate things; though we would share looks sometimes, we would never say no. We just worked together to figure out how to make it work—it is after all our job to design our customer’s dream home. I enjoy working with Ken, he is so hospitable and accommodating with clients and is extremely knowledgeable. He worked with different products from a variety of manufacturers, and I could rely on his expertise to fully understand the limits and possibilities of the home technology. When we work together, we’re always pushing each other to find a solution and we have a great time. What did you do to incorporate your clients’ personalities into the home? The front of the house ties in with the clients’ interests. The homeowners own a car business and they wanted a six bay garage on a tight lot, so I really had to challenge myself to make it work and look good. When you drive down to the house, you can see the defined ‘his’ and ‘hers’ garages. One garage bay to the left and then another to the right of an open courtyard. It’s fun because his side of the garage bays is filled with red automobiles in it and her side shows a love for a variety of styles—giving them each their own space to showcase their likes and personality. What did you learn about smart home technology during the process? I was so pleased with how the electronic blinds were incorporated into the architectural details and how it allowed us to achieve just the right level of lighting—it blows me away how smart home technology can do that. I was so impressed by everything I learned about Control4 home automation and entertainment. With it, I could create a space that is perfect for entertaining yet all technology mess is hidden away so our designs still have that polished look. I used to worry about designing smart homes and the effort it would take to teach a customer how to use their home technology. However, I’ve learned that Control4 technology is very intuitive, and the way The Premier Group designs and programs their smart homes is great because everything is done in a way where you don’t have to spend a lot of time teaching the client how to use it.